Nowadays people not only indulge themselves in vacationing the beautiful tourist spot during the holiday period but they also indulge themselves in different adventurous sports too. And so, the scope of participation in different adventure sports has been increased, whereas, the risk factors related to such sports are decreased exponentially. Among all the favorite adventure sports, Kayaking is one of the most popular water rafting adventure sport. As we all have the basic idea of what kayaking is, we all must know how a kayak exactly looks. We often noticed that basic kayak are not pet-friendly, so taking your dog while going for kayaking is really tough. Therefore, here we are taking the initiative to make your task easy by reviewing the best kayak for dogs. We have strictly searched for particular features in a kayak for dogs. The kayak which had those features got a space on our list. We have tried to make a balanced list from where the kayak you choose to buy will be worth every penny. Our list on best kayak for dogs consists of slightly expensive ones to the more affordable ones. We tried to put not only the positive points but also the negatives as well. Let us make it very clear that someone’s negative can be other’s positive, so be very sure before deciding for buying your kayak. Keeping the basic features in mind, try to choose the one which has features that suits your comfort level. Without further ado let me start my list of 10 best kayak for dogs. Perception Hi-Life is not just a kayak; it also works perfectly as a standup paddleboard. This cool versatile two in one kayak is the most comfortable kayak for your dog. The rear deck design is such that a dog can easily all by himself get on the kayak or even get on it directly from the water. Both the front and rear deck has low sides, and the back deck has a hand grab also. Though this being a standup paddleboard takes the cake, it also has some of the best features. The seat is well padded and adjustable. There is an accessory mount for fishing gear and other essential tools and even a built-in cooler under the seat. The removable and flexible fin at the rear bottom makes it easy and smooth to cut through the water while tracking. It is very lightweight but a quality product which can be carried with just one hand. Ocean Kayak is a 12 feet sit-on-top recreational kayak which works both as solo and tandem. It easily fits two adults and a dog which is perfect for fun family water rafting. The padded seat can be moved to the middle for solo riding. Compared to other kayaks it is more spacious. It is convenient to get on and off due to its open hull design, especially for dogs. The space it provides and the suitable open design easily make it a well-deserved contender of the best kayak for dogs. This one comes with a skid plate cover which protects the keel of the kayak for increasing the durability. The overlapping foot wells allow center-seated paddlers to keep their feet comfortable according to how they want. The self-bailing feature distinguishes it from other kayaks. Due to this feature, the water is drained automatically. The seats allow a custom fit and offer four-way adjustability. Lifetime Tandem Sit-on kayak floats great, tracks nicely and very easy to maneuver. It can be used as a single person kayak also. 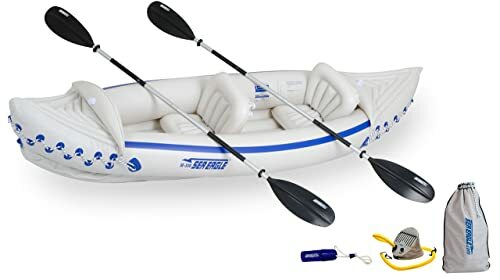 It very easily fits two people and even a dog, so perfect for a family water rafting. It comes with two well-padded backrest and ample of space to adjust the legs. There is no need of buying paddles separately as it comes with two 2 sided paddling. 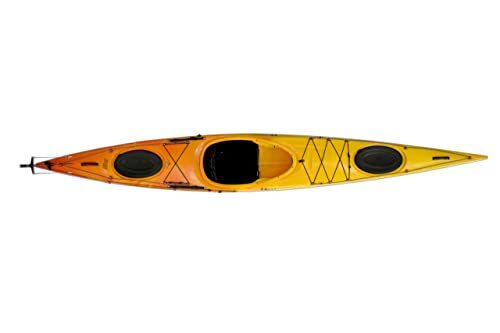 This kayak is perfect for the beginners as its primary focus is giving more stability. 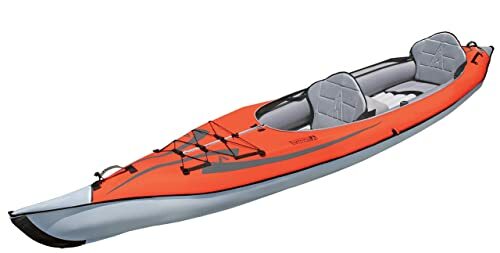 The material used to make this kayak is high-density Polyethylene, and the construction of the body frame and the hull design is such that, it is impossible to tip over during intense rafting. It comes with a 5-year manufacturer warranty which provides conviction on the durability of the product. It is a sit-on kayak that comes with backrests only. The backrest is very comfortable during long rides as well. This kayak is by far the most advanced one. The whole idea of its construction is very well thought and unique. It can be used both as solo and tandem paddling. It is inflatable hence portable and made of three layers of high-quality material. It comes already assembled and takes approximately 10 to 15 minutes to set up with the air pump. It can be converted into an open deck kayak as well as solo or tandem paddling kayak just by arranging the deck and seats. It offers excellent stability and no twist and turns while tracking. The pointy bow and stern design, along with the skeg helps to increase the speed and cuts right through the water. It gives plenty of room for a dog to sit while one can enjoy tracking in the harshest water conditions. Unlike many other kayaks, this one comes up with a year guarantee. As the name says, the old town is the oldest and largest kayak manufacturer brand. So, for obvious reasons, they can’t get wrong. This kayak is for solo paddling and has good space for taking the dog for rafting. Like any other Old down products, this kayak is also made of high-quality material for excellent durability and stability. 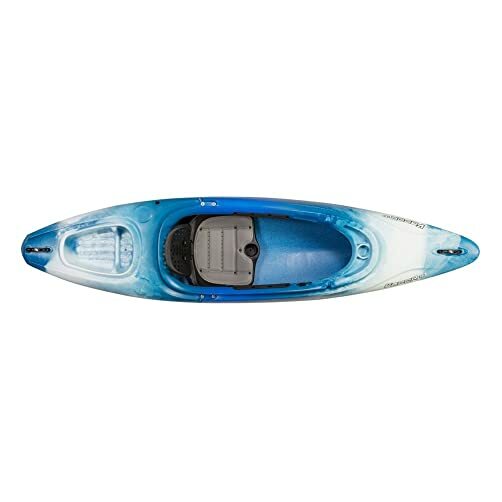 Though this kayak is perfect for flat water, it handles rough water pretty well. The large cockpit allows smooth entry and exit which is as much important as having enough space for the dog to adjust. Getting a pet on a kayak is not very easy unless the kayak is made keeping that in mind. This one has done an excellent job regarding that which makes it a useful and convenient kayak for dogs. It is affordable and comes with all the necessary features along with a rear cargo hold, cup holders and a cockpit rim paddle-rest. 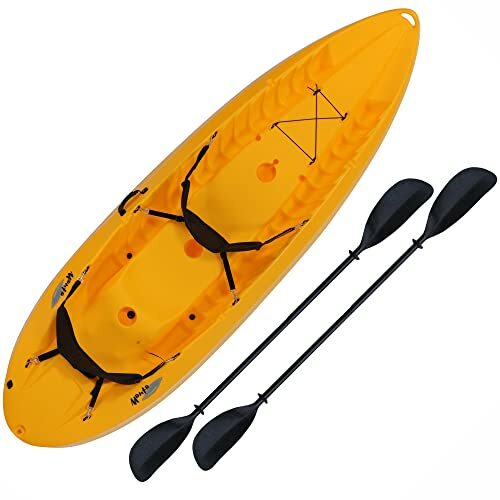 This durable and sturdy kayak which is made of Polyethylene is a perfect one for flatwater rafting. The precise amount of chine and keel makes the hull design perfect for tracking and easy to maneuver in rough conditions at high speed. It is stable and handles waves comfortably. 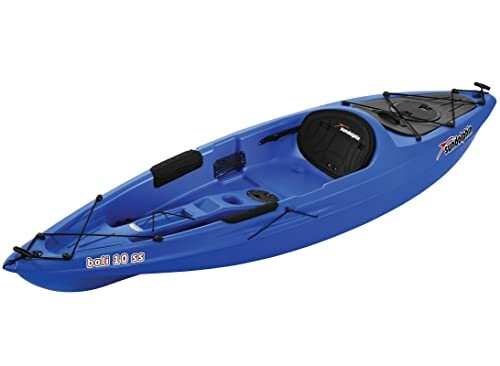 Not only this kayak has a pilot rudder system which is controlled by the leg braces but also has some features including a paddle hood, safety straps, shock cord storage, and a security bar. The pilot rudder makes it very easy to steer the water and control the kayak in strong currents, winds, and waves. The front and rear storage compartments had dual density hatch covers so the food and accessories will remain dry. It has the custom fit seating system which makes it comfortable for the user of any height. There is a right amount of space to rest the legs, and also the thigh braces allow to have a good hold on the kayak while taking the turn. This Old Town tandem paddling recreational double kayak is the best looking kayak in our list and also the most expensive one. The most important thing that attracts you to this kayak is its long body frame and sleek design. The minute detailing done in constructing this kayak is worth noticeable and worth all the money spent on it. It easily fits two well-built adults, and if the child seat is removed, there is ample room for your dog to sit and enjoy the tracking. 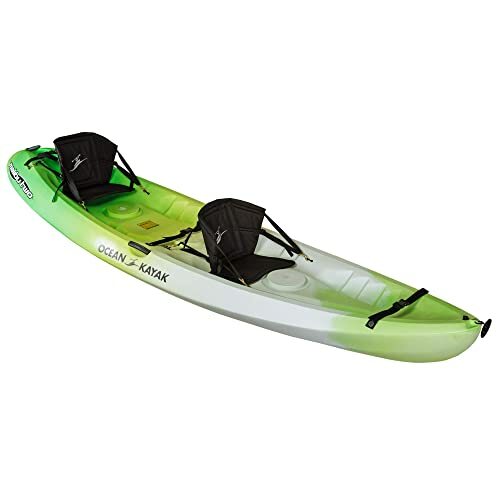 This kayak made of high-quality material is very lightweight and durable. 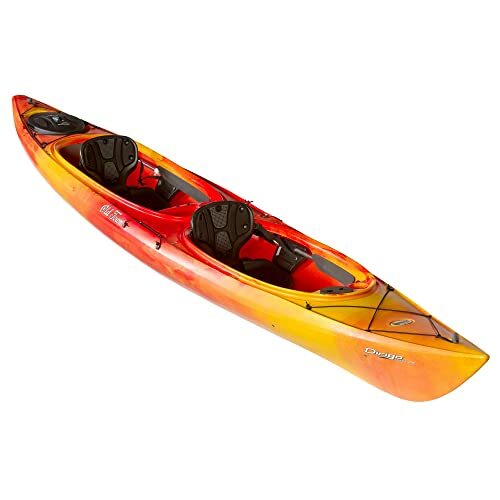 For smooth river rafting, this kayak is the best choice because it cuts through rough water quickly. This is one of those rare kayaks which hull comes with a lifetime guarantee. It is also compatible with the rudder system though rudder needs to be bought separately to give surety of additional speed in rough water conditions. Sun Dolphin SS kayak is a lightweight, and single person sits on top kayak. It is very stable and allows easy entry and exit due to the open cockpit. The smooth entry and exit make it easy for the dogs to get on the kayak without any hassle. It is self-bailing, so the water drains automatically from the kayak. It tracks very well and very easy to maneuver in both fresh and saltwater. It costs quite less but offers some outstanding features giving good value for the money spent on it. It has a sturdy construction, made of Fortiflex High-Density Polyethylene. The material used in it is also UV-stabilized which ensures the color of the kayak remains intact. The dry storage compartment is tied with shock cord. It also has a portable accessory carrier to store extra accessories. The legs can be adjusted comfortably, and it has protective thigh pads and adjustable foot braces. Sea Eagle is known for their inflatable kayaks. Not only they are easy to carry but also come with two-sided paddles. It hardly occupies any space and very easy to carry. One just needs to unfold, inflate it with the foot pump and attach the sit; for that it is convenient. As it is rated up to Class III so without any doubt, it can be used in narrow passages where precise maneuvering is required. Those who are not very keen on using inflated kayaks due to the misconception of these not being everlasting can try Sea Eagle SE330 as it is made of Polykrylar which ensures long-term tear resistance. This kayak is for solo paddling and has good enough space to make your dog sit while paddling. Keeping all the features in mind, especially the cost, it can surely have its place in my list of kayak for dogs. If the previous kayak was the best solo paddling inflatable kayak, then Sea Eagle 330 is the tandem paddling inflatable kayak. The good thing about Sea Eagle kayaks is their low price, but the best thing about these has to be the paddles. Paddles are sold along with the kayak, no need to buy them separately. This two-person inflatable kayak comes with two 2 sided paddles and a foot pump naturally. This is made of extra thick Polykrylar which makes it puncture resistant. It offers 3 years guarantee and also rated up to Class III whitewater. Your dog’s sharp paws will not harm this kayak as it is too sturdy. The seats are inflatable and can be adjusted easily after inflating them separately. There are two skegs in the bottom of the kayak which helps to track smoothly in the water without compromising the speed. Easy to carry and store, this kayak is a sure shot winner. Above I have described my detailed review on best kayak for dogs. All of these are well-made kayaks without any doubt. They have kept the basic features intact, but each one has at least one or two features which help these kayaks to stand out in the heavy competition. Some are affordable, some are reasonable, and some can be from the expensive side but not at all unjust. I have tried my best to make a balanced list where every kind of kayak will have its place and will be the best of their kind. It is up to your requirements and budget to decide what kind of a kayak you need. The motive of this list was to help you buy the perfect kayak for your dog after getting a good idea on the features of the kayaks. I hope this list will be a great help for you while buying your kayak.